Many years ago, I can remember trying to find ash trays that were not badly pitted so they could be taken apart in order to replate the tray part. We would then find some rivets to put them back together. Now there is a really nice reproduction available of the '65-66 and '67 model Mustang Ashtray! They both look very nice with the correct plating and rivets. If you want to get really picky, like me, you may want to remove the front cover to paint it. You could probably do just fine though by painting the cover while it is still attached. Another really interesting note that I just never paid any attention to-the '67 Mustang ash tray is different from the '68 model. You cannot use the '67 on the '68 or vice versa. Maybe we will see the '68 model soon. 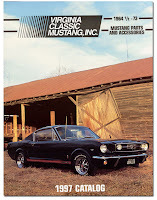 You "old timers" probably remember our 1997 Virginia Classic Mustang Catalog Cover. This certainly was not the best photography we ever had on a cover, but it may have been the most popular. This Black 1966 Mustang GT Fastback has actually been connected with Virginia Classic Mustang since the early '80's. It was purchased in the early '80's at a Mustang Club of America event. We had it a while and sold it to a customer in Manassas, VA. It was re-purchased and then sold again to another customer near Lynchburg, VA. This gentleman stored it in his garage until Becky purchased it and brought it "home." After it was featured on the 1997 Cover, everyone asked, among other things, about the wheels and tires. We put together this wheel and tire package featuring the 14 x 7 Mustang Styled Steel Wheels along with BF Goodrich Radial T/A Tires. This package continues to be very popular. It is a cool car with the GT package, Rally-Pac, 289 4V engine, Automatic Trans., Console, Air Conditioning, AM 8 Track Radio, Deluxe/Pony Interior, Power Steering, and Deluxe Seat Belts. The car did not go very far...so we will be probably seeing it quite often. One of the most popular options to add to your '65 or '66 Mustang is the Simulated Woodgrain Steering Wheel. Unfortunately, the originals were really prone to cracking. Very seldom do you see an original that does not have a small crack or, more likely, a large gap in it. We have handled the IN882 Complete Woodgrain Wheel (except for the cap) for quite some time. But what if you already have a wood steering wheel with all the parts, and it needs replacement due to being cracked? Well, we now have the answer! This is a really nice duplicate of the original. It is only the steering wheel itself-no extra parts. The simulated woodgrain part looks very nice with a grain pattern and the spokes are a nice, new brushed finish, both like the original. This is a great option to spruce up your interior by replacing that old cracked and shabby original wheel. Our part number is IN8822. 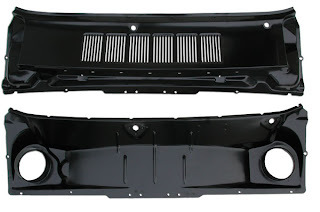 Well, everyone has been asking and asking...we now have the Cowl Assembly for the 65-66 Mustang! It comes in two pieces and includes the top grill and the bottom part that usually needs repair or replacement due to rust. If you have never seen this assembly apart like this, you will quickly see why the cowl rusted due to poor drainage. Please note that the top part is the late 65-66 design in that it has the "indentations" for the flange style wiper arms. 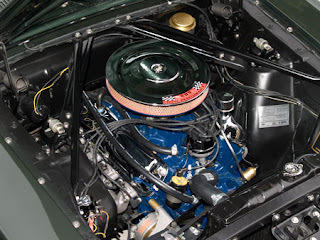 The 64½-early 65 car had the threaded wiper posts that required the chrome nuts so no indentations on those models. We posted the other day about this book by Kevin Marti at Marti Auto Works, but we wanted to let everyone know that they are now in stock!! We just had time to glance through this book, but we can tell you that it contains a wealth of information. 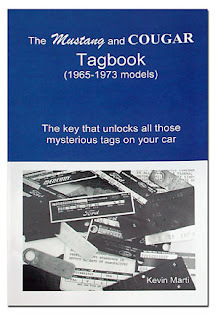 Not only are there tons of information about decoding all of the various tags on Mustangs and Cougars, but there is information about colors, dates, variations in the tags, locations of the tags, etc. 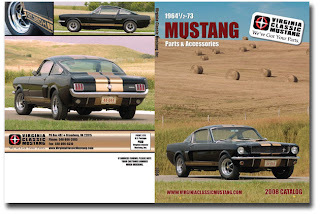 We've been selling Classic Mustang Parts for over 30 years and can tell you that this is information that is very valuable and has never been published for purchase by the general public. 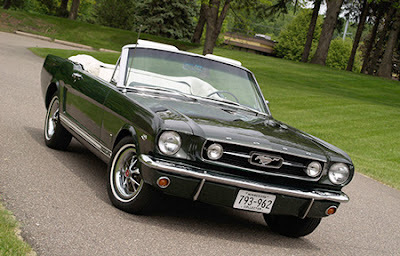 People often ask me what I recommend to improve the safety and drivability of the Classic Mustang. The best area for upgrade is the braking system. 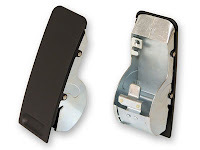 Brakes work by using friction, the contact of shoe to drum or pad to rotor, to convert motion into heat. The heat is then carried away by the air around the wheel. The brakes must cool in order to work again. Disc brakes do this job much better than drums. They do not make the car pull to one side if they get wet. The rotors can take and hold more heat than drums, and they get rid of the heat faster. This means you can stop again more quickly. Remember, hot brakes are fading brakes! On cars equipped with four wheel drums I highly recommend a front disc upgrade. 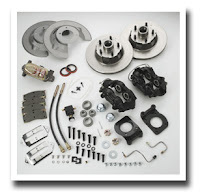 Our most popular kit is for the 65-66 V8 model with the Dual Reservoir Master Cylinder. This will improve the safety and drivability of the car and make all your cruises more fun. For you detail freaks, we will give you a quick look at the reproduction vs. original styled steel wheel. We were lucky enough to borrow an original from Jeremy Turner at Maple Hill Restoration. He is also performing the restoration work on our Poppy Red Hi-Po Convertible (you'll see posts on that car later.) First, it is interesting to point out that the original wheel is dated. This particular example's month date is hidden by the rivet, but you can see the year. You will also find the Kelsey Hayes (the original manufacturer) stamp. The center of the Scott Drake Styled Steel Wheel is flattened like the original. The stamping detail is also very, very close. These photos show the back of the wheels. The original was riveted together. The reproduction has "simulated" rivets and is welded to meet today's standards. The back stamping and configuration is virtually identical. If you have any questions on these wheels, please give us a call. Monte Carlo Bars are a great upgrade for any Mustang. For years, customers have been using the 65-66 ones that are very close to fitting the 69-70 models. Now we have ones made specifically for the 69-70. Monte Carlo Bars were originally installed on '65-66 GT350's. They were developed to stop shock tower flex and maintain proper wheel alignment during hard cornering. This extra support also helps prevent shock tower stress cracks. Copied from the original design, our bars feature a new thicker diameter tube and improved fender brackets. We have also stamped square holes in the top of each fender bracket to allow for the use of lower profile carriage bolts. We, of course, have 65-66 and 67-68 models only in Black, Chrome and now Polished Stainless Steel!! Just search "monte carlo bar." We have gotten a lot of favorable comments about the photography on the covers of this year's catalog. As mentioned on the inside front cover, the beautiful photography is the work of Troy Kruger. That's his dad's GT350H on the covers. 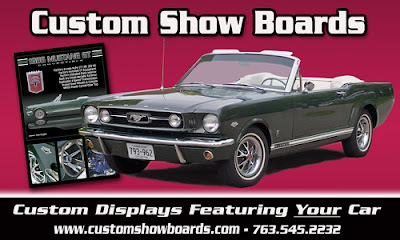 We invite you to check out more of Troy's work by visiting his web site - http://www.customshowboards.com/. You can read about the show boards that he produces and even check out some of the incredible samples in his gallery. We have also listed his site under our links on this page. We never promote something before we get the item in stock, but this is an exception. We are expecting this to be a fantastic research book. We should have them in stock very soon. We will have more about this book in a later post. Order part number LT611. 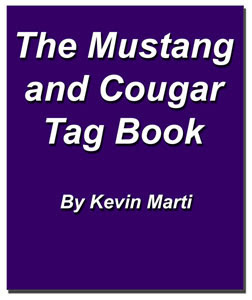 This new book by Kevin Marti features details never before published about various tags used on 65-73 Mustangs and Cougars. Kevin Marti at Marti Auto Works has been researching this subject for over 20 years. This is a complete guide to decoding the engine, transmission, carburetor, steering box, power steering pump, axle, radiator, buck, VIN, ownercard and door data tags on your car. Detailed pictures showing actual tags and noting running production changes and assembly plant differences. Accurate charts that show third digit on some trim codes, how to decipher the date codes on various tags, and so much more. Valuable for restoration or authentication, it is possible with this one book to establish whether major items on a Mustang or Cougar are "numbers matching." We are proud to offer many parts manufactured by Scott Drake Enterprises. We have known Scott for probably 25 years, and, like us, he takes great pride in the products that he manufactures and sells. You will see more posts here that feature his products. We are very happy with Scott's Styled Steel Wheels. We have handled many reproductions over the years, and these wheels are just way nicer than any others that we have seen. The stamping, paint, authenticity, and chrome are impressive. They always seem to balance up nicely also. 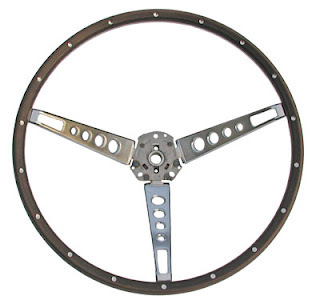 They are available in all chrome or the 1966 (HB-3) and 1967 (HB-4) black rim style that use the trim rings. We also have various sizes and widths. In a later post, we will get into the details comparing an original wheel to the Drake wheel. Colorized Mustang Wiring and Vacuum Diagrams on CD!! What a cool item! We just got these in, and they are really nice. Just bring it up with Adobe Reader like our Shop Manuals and Master Parts Catalogs and zoom, print, etc.! We currently have them for 1965 (part# LT265), 1966 (part# LT266), and 1967 (part# LT267) models. We will have other years very soon! Below is a description of the CD for the 1967 model. 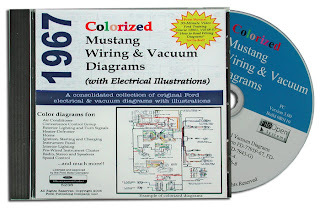 The 1967 Colorized Mustang Wiring and Vacuum Diagrams CD-ROM contains a complete and comprehensive collection of wiring diagrams, schematics, and electrical illustrations. And, to make tracing wires easier, each wiring diagrams and schematics has been painstakingly colorized! Each diagram and illustration is from an original Ford Motor Company publication and are the same manuals used by Ford technicians to troubleshoot electrical repairs. Written in an easy to understand format, this manual contains step-by-step instructions designed for the novice and the expert. In addition, this CD-ROM contains one of the original Ford training manuals, “How to Read Wiring Diagrams”, to help those unfamiliar with how to read diagrams from the 1960’s. This CD-ROM was compiled using several original Ford Motor Company publications to provide a more comprehensive collection. 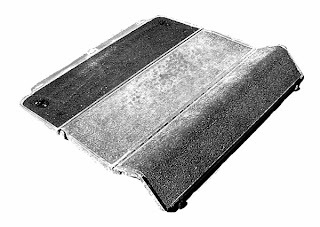 The contents of this product were extracted from: 1967 Cougar, Fairlane, Falcon, Mercury and Mustang Shop Manual (Form 7760-67, March 1967), 1965/1972 Ford Car Master Parts and Accessory Catalog (Form FP-7635B, May 1975), 1967 Wiring Diagrams (Form FD-7795P-67) and the How to Read Wiring Diagrams (FD-7943-G). There is a lot involved in working on and restoring a Mustang Folding Rear Seat Assembly in a Fastback. 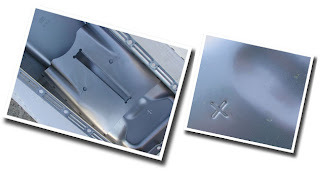 One of our popular parts is the Chrome Trim Set for the seat. Order Part Number IN775. This set is currently listed for a 65-70 model, since it can be made to fit all of these models. We will be getting sets specifically for 69-70 models this week. They are listed here. We will have a very limited number of these, so please do not hesitate if you need a set. The manufacturer is out of them again, and we do not know when we will be getting more of them. We hope to post more information about the installation of this chrome set along with more good information about Mustang Folding Rear Seat Assemblies. We have contacted Sam Griffith from http://www.folddownseat.com/ about contributing here, so we hope to have some informative posts on the Folddown Rear Seats. We have also listed the link to his site on our "links" section. This site contains tons of great information! 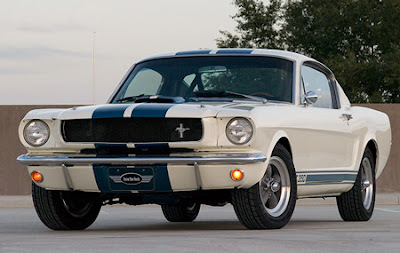 For me, the 1965 GT350 Mustang is just the ultimate Mustang. It's a race car for the street. It's loud and just cool. I remember the very first GT350 I ever saw. It wasn't a '65, but a 1966 GT350H. It was one of the rare green ones. Ironically, I learned to know the owner and ended up selling his car for him many years later. I sold it to a gentleman that became a good friend of mine. He later sold the Hertz car and bought the first GT350 that I ever owned. It's a nice '66 with some personal touches that I added like Weber carbs., R-Model roll bar, R-Model front apron, R-Model gauges, R-Model valve covers, and American Racing Torq-Thrust wheels. He's still got it. I recently found this video and absolutely love it. Jay Leno really gets across the "true idea" of a 1965 GT350. I remember talking to some of my "Shelby Friends" when Jay was looking for a '65. Everyone had to kind of keep quiet that the buyer was Jay Leno. He wanted to pay fair market price, not extra because of who he was. I'm glad he has one. He is a true enthusiast. I love to see people have a GT350 because they just love the car, rather than having one for what it is now worth. You can tell the difference...but that's for another post. This is a really nice part that recently arrived here. The stamping is really nice and sharp. The original pans are always dented or rusted. 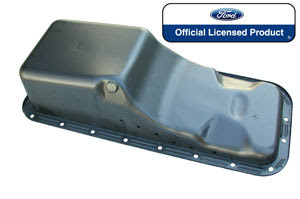 Please don't confuse this one with the cheaper Big Block Oil Pan on the market. There are a lot of differences. 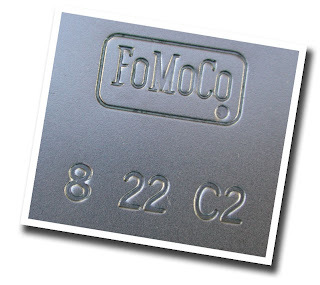 It's Ford Licensed and features the FoMoCo Logo with a production date stamping. It has a 5 quart capacity, just like the factory pan. The internal baffling and detailed stamping look great! - Again, just like the original. It was reproduced from the original Ford Blue Prints! Here at Virginia Classic Mustang, we decided to create a blog to express our thoughts, keep our customers updated about new products, feature customers' cars, provide you with tech. tips, and just talk about 65-73 Mustangs. My dad and I started selling Mustang Parts way back in the '70's. We have always been car fans, and it was great to start a business doing what you loved. I always say we just "grew with the hobby." We will try and keep the posts short, but interesting. We welcome your ideas and pictures of your finished or "in restoration" Mustangs. I will be posting along with some of the staff. Thanks for reading. Let's get started.